This week I'd like to feature more covers by the amazing graphic designer, Kelly Eismann. (Last week's Shelf Candy of Graceling was designed by her as well.) While I was researching last week's post, I discovered Ms. Eismann's website and was pleased to find many more pretty covers there, including the Last Survivor series by Sarah Beth Pfeffer. I already had this series queued up to feature on Shelf Candy as well as to review, so it was a pleasant surprise to discover them on her site. I now have found my first Favorite Graphic Designer in Kelly Eismann! The covers are so beautiful. In case you haven't read the Last Survivors series yet, you should right away. 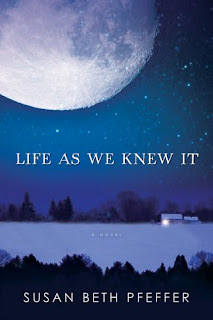 Here's the synopsis for the first book, Life As We Knew It, from Goodreads. So, as you read in the blurb, the moon is knocked closer the earth, so hence the big beautiful moon in all of the covers. 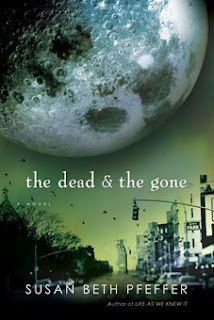 The Life As We Knew It and The Dead & Gone covers were designed by Kelly Eismann. (I couldn't verify that This World We Live In was, but they definitely kept the same tone as the first two, if not.) According to her website, Eismann is not only the talented designer of many beautiful book covers, she also is the lead singer in not one but two rock bands in San Diego, CA. Pretty awesome! Award-winning Graphic Designer and Art Director, musician, world traveler, artist, and Photoshop expert—Kelly Eismann has worked in the design industry since 1993 as a graphic, web and interactive media designer, specializing in advanced photo manipulation, professional color correction, photo collage and digital illustration. Having earned her Bachelors Degree in Fine Art from San Diego State University, emphasis in Graphic Design, Ms. Eismann has spent a majority of the last 8 years working as Senior Packaging Designer for Harcourt Trade Publishers, designing and digitally illustrating book covers and jackets for the adult and teen Trade markets, all the while maintaining her own busy print and web design business, Eismann Design. In early 2009, Ms. Eismann happily took on the role of Instructor at The Art Institute of California—San Diego, where she has been enjoying the opportunity to share her graphic and web design expertise with the Fashion Marketing & Management students. Above all else, Kelly loves being a mom and, in her free time, lead singer and keyboard player for two San Diego-based rock bands. I love the different pictures of the moon that are used on each of the covers! Awesome! Thanks for stopping by! I just checked out your Shelf Candy and I love it. Can't wait for Insurgent to come out :) Great blog, I'm your newest follower. Beautiful covers! The moon is gorgeous, thanks for showcasing theae books! I actually hadnt heard of them before and they look great! Thanks for stopping by! You should check this series out, it was pretty good. Loving the way that they look like the belong together. The huge moon is both beautiful and a little mysterious. I definitely want to know more. Kelly Eismann is gifted. Thanks for sharing it. I agree with you, Eismann is amazing! The moon is menacing and beautiful at the same time. Thanks for hosting such a great meme! Hi, Steph! I'm a new follower. Your blog is TERRIFIC!! 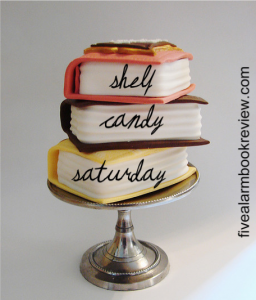 And I LOVE your Shelf Candy picks!! They're all so dramatic, so simply designed, and yet, so effective. They pull a reader in immediately. I know I want to read this series! Besides, I LOVE dystopias and visions of the future!! Thanks for featuring these!! I just stopped by your blog and am your newest follower as well. I love that you featured The Daughter of Smoke and Bone! It was my Book of the Year for last year and I just love it so... You should check out this series, I really enjoyed it. Gorgeous covers and what an awesome sounding series! 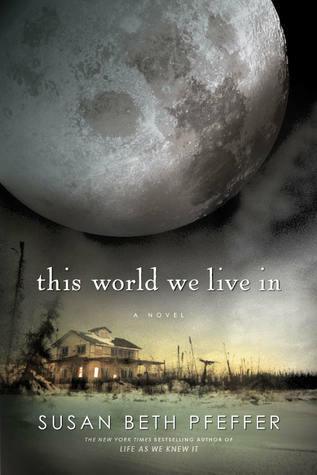 I love the beautiful moon pictures and I love how the covers tie into the books.